Joy Creek Photo Archive (c) all rights reserved This large, evergreen shrub is from the Mediterranean area of Europe and can tolerate both heat and coastal conditions. The foliage of Atriplex halimus ranges from rounded to somewhat diamond-shaped, measuring up to 2.5 inches long. 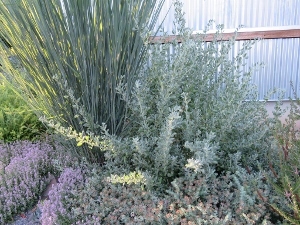 Its silvery color makes it an ideal shrub to combine with other low-water perennials, bulbs and grasses. In the summer, it bears foot-long panicles of tiny whitish flowers. As a bonus, its leaves are edible. Late Summer. 6 ft. x 8 ft.